I don’t remember what it felt like to sit in my mother’s lap or the sound of her voice reading to me. You won’t remember these things about me either. You won’t remember that our house had wallpaper on the ceilings, that we stood on ladders and used a machine to steam and peel it off, our arms aching from being held aloft, dirty water dripping on you as you crawled around below. You won’t remember that there was music playing always, or that we hired an opera student to babysit and sing you arias. You won’t remember that I painted whimsical fish and ocean sprites on your bedroom wall, or later the Mono Liso. Or how I held your flailing arms and legs and rocked you in a big blue chair, all because you wanted chocolate milk at 3am. You won’t remember me pushing the stroller through the snow, you all bundled in fleece, because it was the only way you’d go to sleep. You won’t remember that all we needed was a sofa to sit back and watch you perform, blissed out while you inhabited endless characters, costumes and worlds all for our viewing pleasure. Or how we banned technology for years just so the show would keep going on. Nor will you remember how your thumb was your best friend and you spoke so lovingly of it, to it. You won’t remember how I marveled—truly—at your tiny, intricate drawings. Or how, when you wanted to fly for real, we hitched you to a harness, strapped on your wings and let you soar from the oak tree. You won’t remember sippy cups or Maymont Park or learning the words to the Peter Pan song and singing it with abandon. You won’t remember tire swings or puddle-jumping or that time I rolled out brown craft paper and let you run around in different colored paint all over it, or how I cut out sections of it later to decorate the dining room wall. You won’t remember how we decided to just work from home because we couldn’t get enough of you, how we sometimes just stayed in our pajamas all day long and were silly. You won’t remember how many times we read Chicken Soup with Rice, or that time we drove to France and couldn’t bother to get out of the car because we were so immersed in a story about a certain wizard. You won’t remember your skinny, knobby little legs running out of the ocean and throwing yourself down to roll around all wet in the hot sand, and then we’d call you milanesita. Nor will you remember the gleeful timber of your voice or how excellent you were at jumping rope, how intensely you danced. You won’t remember how long you believed in Santa Clause or how easily you accepted the Reyes Magos when they showed up, because your faith in our stories was abiding. That’s ok. I still remember. Just before leaving Europe for good, we did something extravagant: We flew the whole family to London to see the premiere of the HP4 movie. Although the movies have always been second-best to the books, that trip placed London at the top of Lucas’ and Fiona’s favorite-place-in-the-world list. So the vivid images of the Goblet of Fire, the World Quidditch Cup Tournament, Cedric Diggory’s death in the maze and Voldemort’s rebirth from a cauldron, were actually trumped by those of the dinosaurs in the Museum of Natural History, ice skating at the Tower of London, and a frigid hike across Kensington Gardens to find the statue of Peter Pan. Harry was still with us, but other things had begun to make noise in our kids’ awareness of the world around them. We had already been in Argentina for a couple of years by the time the seventh and final book came out, and both kids had read the entire series on their own – some books more than once. In fact, they probably sat and listened to me read Harry Potter and the Deathly Hallows more out of a spirit of solidarity with me than anything else. Even so, we still had a good cry together at the end: not only was Harry’s story over; it was the last time the three of us would sit and read together. We held on to the knowledge that we still had several films to go, which softened the blow a bit. After that, there were just two more notable HP moments to add to the lot. One came in the most unexpected circumstances during a long hike in southern Patagonia one summer. Looking at 6 hours between departing the town of El Chaltén to get to one of the jaw-dropping glacial blue lakes in the Andes, the ‘how much longer’ question loomed large on our trek. Among our arsenal of stories, jokes, snacks and mind games to distract whining hikers, 20 questions always worked well. This time I decided to give it a Harry Potter theme. The kids’ categorical questions – Is is a magical creature? Is it a spell? Did it first appear in Book 3? 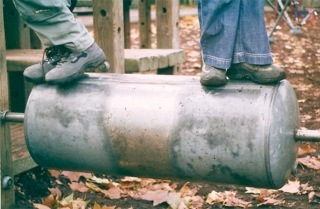 – soon became a source of curiosity for other hikers on the trail, who started joining in. We ended up with a huge line of international Harry Potter fanatics all playing along with us! Seeing my kids as part of a global community of readers? Very cool moment. So it’s been ten years since we started reading Harry and the time has come to say goodbye. Our final farewell at the movies last month was a fitting close to the saga not for its cinematographic recreation of The Deathly Hallows. In fact, the film took a backseat to the packed theater of fans, many of them dressed in Hogwarts robes, who clearly knew every scene by heart from multiple readings of the book. It was a crowd of readers whose real tears preempted every tragic death, whose shouts, cheers and applause mixed with the raging battle of Hogwarts students on screen to the point that it was hard to distinguish movie from audience. The effect of the collective emotions of all those teenagers not only surpassed the movie, they made the movie. Unforgettable. The benefit of reading to one’s children goes without saying. What is perhaps not so often mentioned is the gift it gives to the parent who takes his child’s imagination seriously. Reading with my children has allowed me to inhabit the fictional places they have loved right alongside them. I have become the voice of Piglet, Brer Rabbit, and yes, Dobbie the house elf. It’s been a privilege I’ll never forget. Farewell, Harry – you will be missed. Fair warning: I am going to gush about Harry Potter. And I’m going to have to do it in installments. So bear with me only if you are a true fan. Since that final trip to the movies with my kids a few weeks ago to watch Harry and Voldemort fulfill their destinies, I have put off writing about it, mainly in hopes of gaining some perspective and reining in my drama queen. But I fear that my devotion to Harry will never really fade, and whenever I talk about him, it will always be with an exaggerated reverence that no doubt seems downright silly to the faithless. The fact is Harry is special to me because of the priceless bond he has forged and sustained between my kids and me throughout 10 years of their childhood. While they have gone through many phases of fascination with one literary character or another – Peter Pan, Merlin, Tom Sawyer –the 10-year run of Harry and his world is unmatched by any other, and has been the stuff of parenting bliss. There were so many memorable moments; it all started with the paper maché owls that came home from kindergarten with Lucas and Fiona in the form of little balls of masking tape with owl faces drawn on and tiny envelopes stuck to them. Lucas would frenetically produce several of them each day after school, saying that he had to get the mail out to his classmates. He had a friend called Sam, who was telling him all about the owls, wands, Hogwarts and muggles (non-magical folk); his enthusiasm to learn more was just brimming over. Vaguely aware of the growing phenomenon of Harry Potter (back in 2001), I didn’t consider exploring the books because of my twins’ age at the time. However, I soon met Sam’s mother and she told me that Sam was an early reader; she had been reading HP aloud with him and discovered it to be a source of fascination and real stimulation for Sam. Because the boys had become such good friends – and were “writing” an HP play for their classmates – I decided that we would give Harry Potter and the Philosopher’s Stone a try. That was the beginning of a journey through 7 books, 8 movies, learning to read, life in three countries, and the passage from childhood to teenagers. So, like Harry’s own passage into adulthood, his story will be forever intertwined with my own kids’. 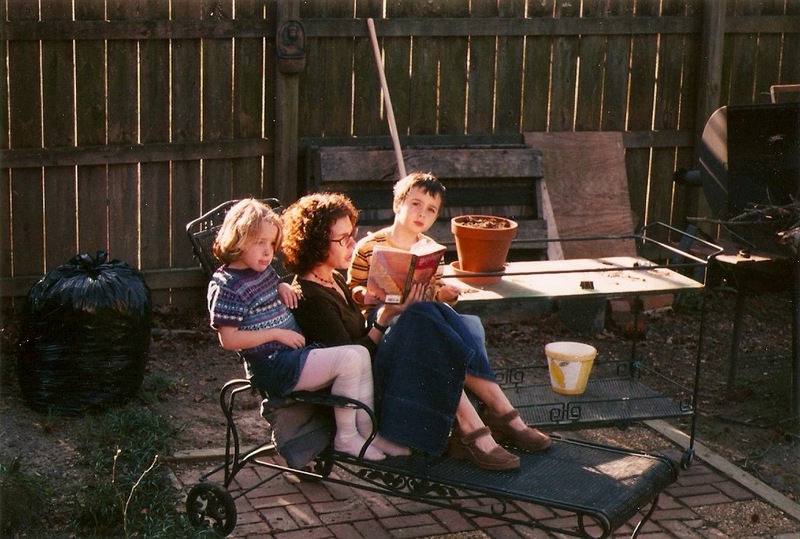 There is a photograph of me reading that first book to Lucas and Fiona out in our backyard in Richmond, Va., not long before we packed up our life and moved it across the Atlantic to Spain. The kids are both staring into the middle distance with such rapt expressions – photographic evidence of having moved beyond picture books into the realm of full-blown imagination. The Harry Potter books particularly lend to being read aloud. Even after the kids started reading them on their own, we still read every new release aloud together. And they would always beg for “just one more chapter, please, Mommy!” And every time we got our hands on the next one, our mutual relishing of that first page together on the sofa – me cross-legged in the middle with one kid snuggled on either side – there was something nearly sinful about it, so utterly unimportant was everything else. The orality of J.K. Rowling’s writing took the kids’ powers of concentration to new levels and set the stage for many of the long road trips to come in Europe, listening to one book on tape after another in the car – Roald Dahl, Maurice Sendak and many others – I think they love road trips for that very reason. On one such trip, Harry accompanied us all the way to France. Although we have always made a point of reading (and listening) to books in their original language, the only audiobook I could find in Seville was HP1 in Spanish. Since my husband had largely been left out of our little party of three when it came to Harry, it was a good way to let him in on it and try Harry out in Spanish for the long drive north. I believe we spent as much time in rapt listening mode in the car as we did exploring the castles ruins, camping or touring the Toulouse-Lautrec museum. We have fantastic photos and memories of that trip, but the narrator’s voice reading Harry in Spanish is the soundtrack that comes to mind every time I revisit them. Then there was the invisibility cloak, conveniently left in the street for my husband to find and bring home to Lucas one day. It was a slippery, slinky black and silver thing that I think Lucas truly believed gave him powers of invisibility and certainly became the prize object in the kids’ costume trunk. Moving to Spain did nothing to tame the kids’ theatrical inclinations – they both lived in costume – so they attended their first HP bookstore event in Seville decked out in full Hogwarts regalia. Lucas with his invisibility cloak and round, broken glasses, and Fiona, of course, as Hermione in a long, natty brown wig (formerly belonging to one of the three Reyes Magos), with a broom and starry wand. Winding our way through the labyrinth of Seville, we ran into friends on the way (as one always does in the streets of Seville). A battle ensued between Lucas and a rival wizard from the other party, with threats in Sevillano Spanish mixed with spells in Latin. Wands drawn, the duel continued through the narrow streets, around corners and on into the bookshop. (I believe they both lost, flayed as they were on the floor as I recall. Hermione took a potion from her bag and revived Harry, thank goodness). As the flagship event in Seville at that time, the local media were there and we made the papers. Sadly, our years in Spain came to an end sooner than planned. For personal reasons, we made the decision to move to Argentina at the end of 2005. Looking back to our first summer in Andalucía, and how we sweltered in a tiny apartment, searching for a place to live, waiting for the ship carrying our container to arrive and double-guessing the sanity of what we were doing, I also remembered the intensity of our immersion in Harry Potter and the Chamber of Secrets and The Prisoner of Azkaban that summer. Those endless hours of reading with Fiona and Lucas were the one constant in a family life that had been completely turned on its head when we left the US and moved to Spain; Harry became our anchor then. And so, less than 3 years later when the same thing was about to happen all over again – this time en route to Argentina – he was right there with us as we mentally prepared for our next adventure in international moving. First, there was the reading of Harry Potter and the Half-Blood Prince that last summer in Seville. I have placid memories of our month housesitting for friends whose house came with a pool (serious luxury in the frying pan of Andalucia) and happy bike rides along the river and through the city, empty of noisy Sevillanos in August. Absolutely blissful end of summer. However, sadness befell us as well. One afternoon my husband came down from his nap to find his entire family in tears on the couch. In complete shock he asked what was wrong, fearing that someone had died. We all blubbered in unison, “Dumbledore is dead!” Obviously, the kids were mourning the death of a beloved character, but in my case, it was much more about the killing off of the last adult figure in Harry’s life and what that represented in the larger scheme of childhood waning. It had to be done. Even though my children were only 8 then, the upcoming move marked a turning point towards the later stages of childhood, in which I knew my presence would become increasingly less important. J.K. Rowling manages to consistently and poignantly capture the different stages of separation between children and the adults in their lives as Harry and his friends grow up. This surely comes from a writer who is keenly aware of her own role as a parent; for that she has my respect.